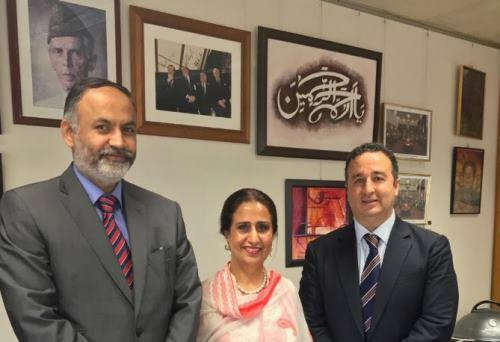 The High Commissioner of Pakistan Her Excellency Naela Chohan and Consul General of Pakistan in Sydney Abdul Majid Yousfani in an expression of close friendship visited the Hon Shaoquett Moselmane MLC in his office at NSW parliament House on Monday, 5th Dec 2016. The Hon Shaoquett Moselmane is a Member of the Australian Labor Party where he became involved at the age of 16 in 1982 and has been a active member ever since. He was elected to Rockdale City Council as councillor in 1995 where he continued until he retired in 2010. was elected Deputy Mayor on four occasions and Mayor on Four other occasions. He is an extremely respected member of NSW parliament holding the position of Opposition Whip in the Legislative Council. 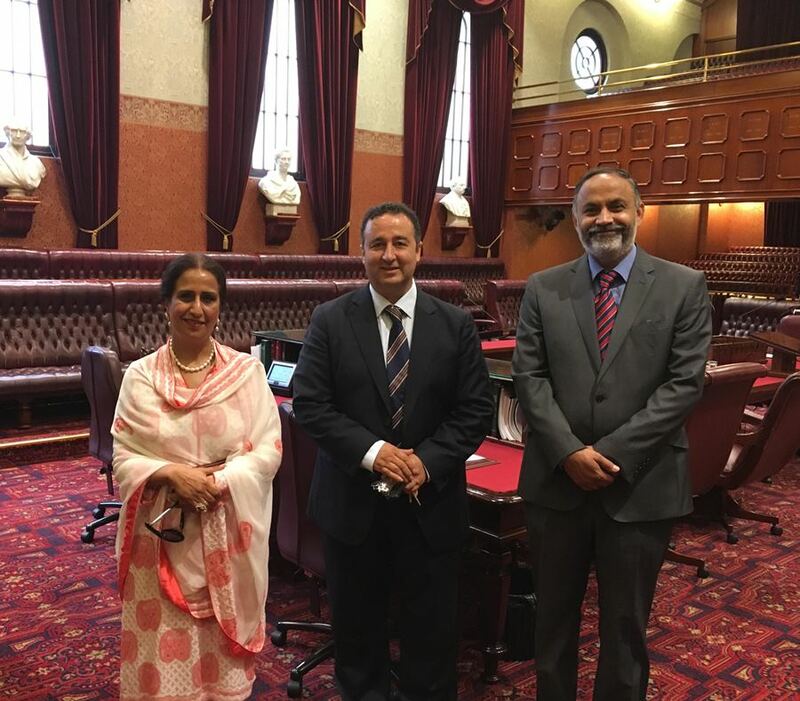 The Hon member is held in high esteem by many communities and in particular the Australian Pakistani community. His friendship and solidarity with the community here and in Pakistan is well known. His friendship goes back for many years but in particular for his effort in raising funds in support of those terribly affected by the floods of 2011. This was followed by his visit to Pakistan with a number of his colleagues assisted by Acting Consul General Hamid Asghar. This delegation included at the time the Hon Amanda Fazio who was then President of the Legislative Council of NSW. She lead the delegation to inspect the impact of the floods and to express solidarity and support to those in need. The Hon Shaoquett Moselmane has since travelled to Pakistan to deliver two large containers of wheelchairs for disabled children. The containers were presented to The late Abdul Sattar Edhi's Foundation, the Edhi Foundation as well as to Alkhidmat, another humanitarian organisation that have a reputation for helping the poor and those in need. In recognition of his friendship with and for his closeness to the Pakistani people, former Consul General Mr Azam Mohammed supported by his deputy Shifaat Ahmad Kaleem and as Dean of the Consular Corp, took the extraordinary step of awarding The Hon Moselmane with an honorary Pakistani citizenship. The Hon Member never tires. Earlier this year, The Hon Moselmane in conjunction with President Iftikhar Rana of the Pakistan Australia Business Council and the community supported by Former CG Uqaili and Deputy Consul Ms Bushra Salam raised funds to support wheelchairs for kids foundation which has once again responded by sending at the request of The Hon member, two more Containers carrying over 340 wheelchairs to to be presented to the Edhi Foundation. These wheelchairs are currently on their way to Pakistan which will soon be followed by the delegation lead by the Hon Shaoquett Moselmane MLC. Gratitude here to Consul General Yousfani for his effort in assisting and facilitating the process in order to get the wheelchairs on their way to Pakistan. In recognition of his work and in response to our proposition, and as a friend of Shaoquett Moselmane, Syed Zafar Hussain (Editor-in-Chief Sada e Watan) requested Her Excellency to present The Hon Shaoquett Moselmane with a portrait of Quaid e Azam Mohamed Ali Jinnah, Which he proudly displays in his office. It was around the Mr Moselmane's past and future efforts and future relationship that discussion revolved but in particular with regards to facilitating his third visit to Pakistan and delivering the wheelchairs to Karachi and Sahiwal . Leading the delegation Mr Moselmane will meet with key provincial and federal Government as well as political and Government officials as well as Business chambers to promote further trade and better ties between our two countries. Also discussed were opportunities for stronger ties between educational and health institutions and for greater exchange of ideas. The meeting which went well over an hour ended with a tour of the NSW Parliament.